There were cries for the inclusion of Gautam Gambhir in the Indian Test squad for the home series against New Zealand and when he wasn’t named in the list the selectors were criticized for their approach of backing the out of form Shikhar Dhawan and continuing to ignore Gambhir despite his rich form in domestic cricket. Coach Anil Kumble and skipper Virat Kohli preferred to go in with KL Rahul as the opener in the first Test but unfortunately he sustained an injury and that ruled him out of the remainder of the series. Gambhir was yesterday named as the replacement for Rahul along with Jayant Yadav who comes in for Ishant Sharma who is recovering from Chikungunya. Nothing beats playing again for d country. Test cricket, whites, red ball and India cap again. Thanks @BCCI, thanks 2 all for d prayers. The coach was also asked about Cheteshwar Pujara and whether he was under constant pressure despite performing well on most occasions. “I don’t think Pujara has ever breathed easily from all you perspective (pointing at the journalists) and some people who are constantly watching him. But at least from the team management and team’s perspective, there’s absolutely no pressure on Pujara. He is someone like I earlier mentioned and he is a very important cog in our team and we have seen over the years his contribution and even in the last Test match we saw the importance of his contribution to the team’s score so I don’t see any pressure on anyone. 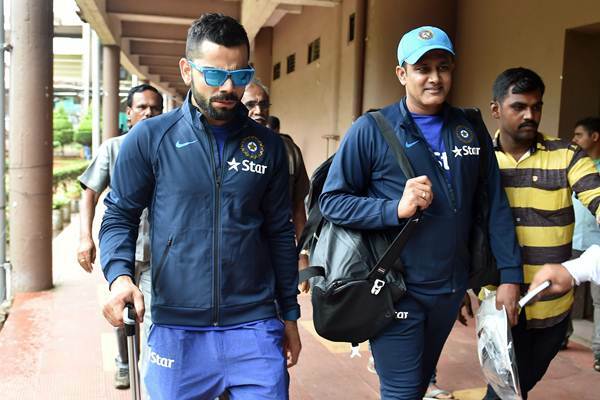 The beauty of this squad is that there is no pressure, yes, there are roles and responsibilities but there is no pressure put on any player.” Kumble said.